Life might not be about choices but moments often are. I was at Uluru in 2002 and I had the choice to climb up or walk around. I chose to go up because I could walk around any time. I did this despite knowing Uluru was sacred to the Pitjantjatjara and Yankunytjatjara peoples. They do not want people to climb signs around the base advise. 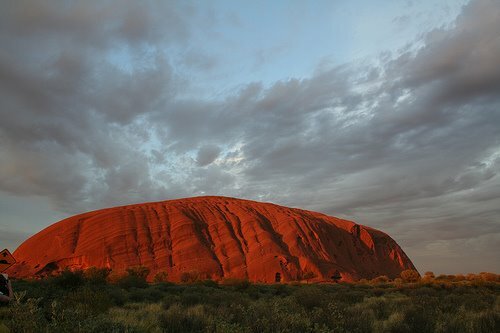 The rock has spiritual significance as the traditional route of the ancestral Mala men on arrival at Uluru. But they left the ultimate decision to me, the tourist, and expected me to make an informed decision. They asked me – out of education and understanding – to choose to respect their law and culture. Despite my education and understanding, I flouted the owners’ wishes and climbed the damn thing anyway. What happens when the owner of anything says to you “I don’t want you to do this but I won’t stop you”? Maybe you think what the consequences are if you do it. And if the consequences don’t seem bad you’ll do it. So I did it. The climb is dangerous. You cannot say you haven’t been warned. It is a long and strenuous climb requiring patience and care especially on the way down when gravity works against you. The hardest part is at the end when the chains run out and there is still (or was in 2002) ten to twenty metres to get to the bottom. If you fell, you probably survive but you’d be a mess. Thirty people have died over the years. You had to inch your way by picking out each carved rock. You were watching out for wind gusts. If I did die, it would be entirely my own fault. The worst thing was I’d be making things hard on the Anangu. They have a traditional duty to safeguard visitors and feel great sadness when a person dies or is hurt. The view of Centralia from the top was great but not sensational enough to have earned it. I’ve no intention of ever doing it again. If I didn’t have the choice in the first place, I might be pissed off I couldn’t climb it but would not break the rules to do it. It wouldn’t have stopped many from coming here to admire this astonishing monolith. There is also an environmental case erosion from tourist damage is changing the face of the rock. Uluru is made from sedimentary rock called arkose sandstone which has been eroding for 300 million years. It is resistant but human impact in weathering and urine is taking its toll. 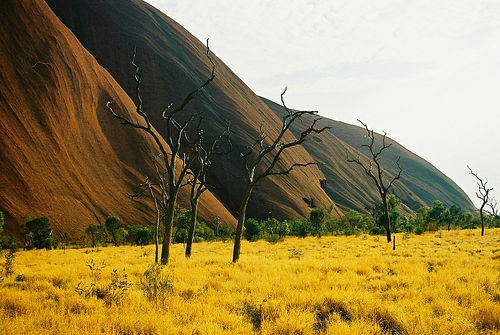 More than 300,000 people visit Uluru national park each year. It is the prospect of collapse in these numbers that stopped the Prime Minister from supporting the move to ban climbing. The land formerly known as Ayer’s Rock has been owned by the Pitjantjatjara people since the Hawke Government gave it back in 1985. The colonials put in a Hong Kong clause and insisted they give a 99 lease to the National Parks and Wildlife agency. The Anangu phrase Tjukurpa includes many complex but complementary concepts including time, religion, morality, the environment and knowledge. There is no word in English that adequately conveys the complexity of that meaning. It has been distilled over thousands of years into an intimate relationship with the land and its features. It is not the ‘Dreamtime’ – there is no such word in Anangu language. (Photo by Michael Pickard) Tjukurpa drives the development and interpretation of Park policy. It prescribes the nature of the relationships between those responsible for the landscape, their obligations, and the obligations of those who visit that land. The Draft Plan for 2009-2019 tackled issues affecting the National Park. The issues are informed by Tjukurpa notions of integrity, respect, honesty, trust, sharing, learning, and working together as equals. The most contentious item was the suggestion to shut down the climb before the plan expired. A survey of visitors showed although one in three make the climb, the vast majority of visitors (98 per cent) would return even if it was banned. The Director of National Parks Peter Cochrane said Uluru was confronting the impacts of climate change and invasive species. “We also need to think beyond the global economic crisis to longer term visitor travel patterns – who are our next generation of visitors? What experiences are they are seeking and what can we offer?” he asked. The question for Cochrane was if they close the climb for safety, environmental and cultural reasons what alternative experiences should they offer. He asked for feedback by 4 September. Hunt called Uluru an Indigenous treasure but said the climb was a matter of enabling “informed consent”. The Shadow Minister got his own consent with a Government climbdown two days later. On Friday he reported this as “Rudd Over-Rules (sic) Garrett on Uluru Climb”. Hunt is wrong about Uluru as is Rudd in rising to the bait. Consent to climb relies precisely on being ill-informed. The simplest solution is to ban it. Cultural, safety and environmental issues disappear in an instance, and the economic issue is a furphy – the recession has nothing to do with it. Given the survey results and creative talents of the Australian tourism industry, it should be possible to answer “will 300,000 still keep coming?” in the positive without the lure of the climb. Don’t make us wait till 2084 for Tjukurpa. The tourist industry has ten years to work out a plan. Get cracking.